The last time I was in Kigali way back in February, Rz Manna were in the process of reducing the service at their Nyarutarama location in preparation for a move to Gacuriro as Bwok Cafe and Bistro. At first I was a little bummed that Gato Keza, the cafe that was there before, had closed. I quite liked it and I’d even had a review half written that I was hoping to finish up, but alas, it closed before I had the chance. 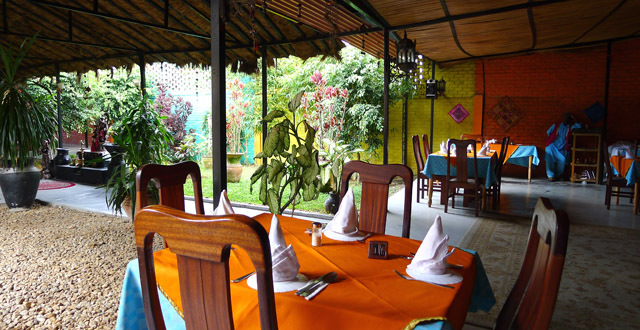 But the good news is that Bwok Cafe and Bistro is one of Kigali’s best cafes and it’s more than an adequate replacement! The atmosphere here is fantastic and they’ve really gone above and beyond with the decor. I felt the same way with their previous Rz Manna location… it was a little dark and not really to my taste, but you could really tell that someone put a lot of care into the design of the place. The same goes for Bwok – whoever did the design here is super talented. They’ve taken an unusual inside/outside space and used a variety of different materials to create a really cool vibe. The place is light and airy, the mix of wood and blocks gives a nice effect, and the mismatched tables and chair even add something to the overall feel of the place. Since I’m only in Kigali for a week this time around and I want to cram in as many reviews as possible, I’ve taken to sticking around and eating breakfast and lunch on one trip. I sort of just become part of the furniture for half a day and eat all of the things I can manage. The only breakfast options I could see on the menu were waffles (Rwf 4,000 to 5,500) or pancakes (Rwf 4,000 to 4,500) and I wasn’t in the mood for sweetness, so started my Bwok feeding frenzy with a bagel and cream cheese. The bagel was fantastic and perfectly toasted but the cream cheese was something more like salad dressing with onions in it. The fact that it needed a spoon to be put on my bagel should have tipped me off that something was amiss. It wasn’t great and it wasn’t cheap, either, so I’d recommend sticking something else on the delicious bagel instead. I recognised a lot of the drinks, smoothies, and frappucino-type things from what was on the menu at Rz Manna. I’ve always loved their iced cafe mocha (Rwf 4,000) so of course I had to try the Bwok version and it was as tasty as usual. They’ve got a full menu of different coffees (Rwf 2,000 to 4,000) including cold brew (Rwf 2,800 to 4,500) and they have a small selection of milkshakes (Rwf 5,000 to 6,500) that I’ll for sure have to try on my next trip. The menu here is quite large and a bit confusing at first glance. There are different pages for different things offered on different days. For example, the brunch menu is only for Friday and Saturday between 10:30am and 4pm. The lunch menu is from Monday to Thursday, noon to 3pm (last order for the grill or pasta is 2:30pm) and dinner is from 6pm to 10pm (last order at 8:30pm). The pastas (Rwf 10,800 at lunch) and the fillet mignon (Rwf 14,800 at lunch) are available both for lunch and dinner. The lunch version comes with the huge salad bar so meals are more expensive at lunch time. Brunch has a mini salad bar and also the choice of 10 different burgers and seven sandwiches. I was kind of bummed when I looked through the entire menu and decided on a sandwich, only to be directed to the top of the page (obscured by the clip holding the menu together) to see that that page was for brunch on Friday and Saturday only. It was a bit frustrating… why stick that page in there on a Thursday if everything on it is only available on Friday and Saturday, especially when pages can easily be unclipped? I was sad, but life goes on and I regrouped and decided on the lunch buffet. The salad bar lunch buffet (Rwf 7,800) is pretty great and I’d say it’s worth the hefty price, especially if you plan on sticking around awhile to graze repeatedly. I didn’t try everything as there are about 15 different dishes, including a Korean curry with rice and a hot pork dish. The salads were varied and interesting with a nice number of Asian salads mixed in. I especially liked the Greek-style salad with ricotta, the chicken salad, and the chili beef salad. Bwok filled up at around 1pm, most people without me really noticing. All of a sudden there was a line of five or six people behind me waiting for the buffet. Had I noticed, I wouldn’t have taken so long deciding between the dishes I wanted but, I swear, they appeared from nowhere! It’s a popular lunch spot but the place is large and there are loads of tables so don’t fret. I’m a really big fan of this place. I’ve heard good things about their fillet mignon steak and I’ll be back to try it, for sure. Plus I overheard (ok, I was spying) someone at the table next to me raving about the Bwok fried chicken (Rwf 11,800 on the dinner menu only) so that’s on my list as well. All up, besides the questionable cream cheese incident, this place is doing everything right. 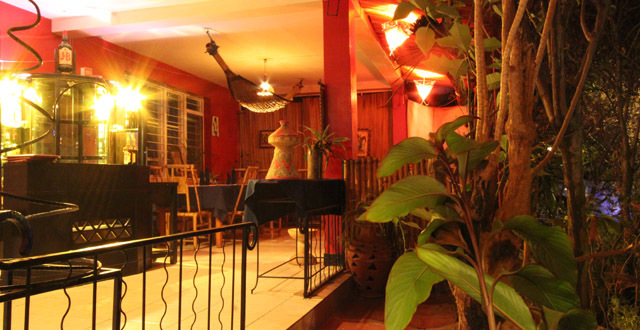 It’s an awesome new addition to Kigali’s cafe and restaurant scene and you should give it a try immediately.